After nearly 2 years of countless hours planning, arranging logistics and trying to raise much needed funds it seemed like the expedition was never going to happen. It wasn’t until Jonas started talking with Ocean Reef about using their Integrated Diving Mask (IDM) and communication system for the dive and explaining the heartfelt story behind the expedition that the ball really started rolling. Not long after, Ocean Reef was proud to announce full sponsorship of the Alexander Hamilton Expedition. Ocean Reef has a company based in San Diego which is well known to be one of the most important USA Navy Bases worldwide. They stated “We are proud to technically and financially support this mission to honor the members of the US Coast Guard Cutter Alexander Hamilton”. 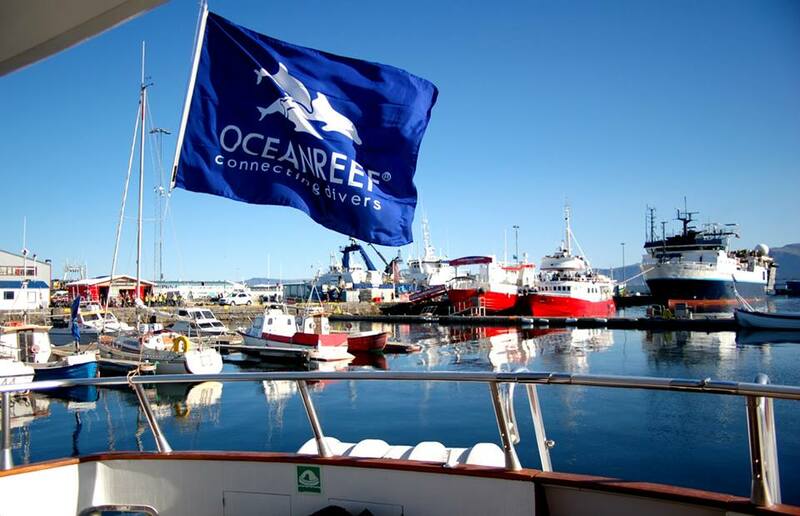 On the 4th of August 2013 the team landed in Iceland for Expedition Hamilton/ Ocean Reef. Aron, Jonas and Erik departed from Egypt while Chris flew in from Sweden where he runs TBI Sweden. When exiting the airport Iceland’s Mother Nature is there to greet you at the doors. Its bare landscapes highlight the four basic elements- earth, air, fire and water- in the most dramatic way. Active volcanoes, bright green valleys, magnificent mountain ranges with white capped snow, glacier-cut fjords, black sanded beaches, spectacular waterfalls and geyser’s are so accessible yet remain virtually untouched by human civilization. This rugged beauty really complimented the Ocean Reef slogan “Go for the adventure” and painted the perfect location for such a rewarding project. The use of specialized equipment was essential for the trip which included Ocean Reef’s new TDiver Integrated Diving Mask and communication system, underwater camera gear, and varying gas mixtures. To increase safety and minimize problems the team planned a series of warm up dives. The dives were used to check equipment and make adjustments, rehearse the dive on Hamilton including transporting and attaching the plaque to the wreck, and an elaborate run through of emergency drills. The new TDiver Mask, a modified top-of-the-line Predator OceanReef Integrated Diving Mask, was used on all the dives including the 95 meter dive on Hamilton. We decided to use the TDiver for a number of reasons. “Dives to a depth of 95 meters/311 feet present dangerous challenges, extreme environmental conditions, a complex task of carrying and applying the memorial, and film equipment complicate this tenfold,” explains Erik Brown. During the dives in 2011 with the two degree water for up to three hours exposure took its toll, so this was one of the primary reasons why we decided to use the Tdiver for all dives during 2013. It’s made a huge difference on the comfort during the dive and we were able to concentrate much better on the task at hand due to the integrated diving mask. Another reason was to be able to communicate better during the dive. We wanted to be able to communicate with the surface in case of emergencies and also between divers to handle our mission more efficiently. We had two dive teams on Hamilton and a surface crew. One dive team was in charge of attaching the memorial plaque using the specially designed magnets so we did not have to drill into the cutter. The second dive team was the video and safety team in which one diver was filming and the second was there if any situation would arise for the videographer or the first dive team. The surface crew was standby for emergencies using the surface communication. To be able to communicate during the dive we were able to be much more efficient during a very task loaded dive. The TDiver and it’s underwater and surface communication system proved its worth. All went very smooth during the dive, both in regards to the attachment of the memorial plaque and filming the video. 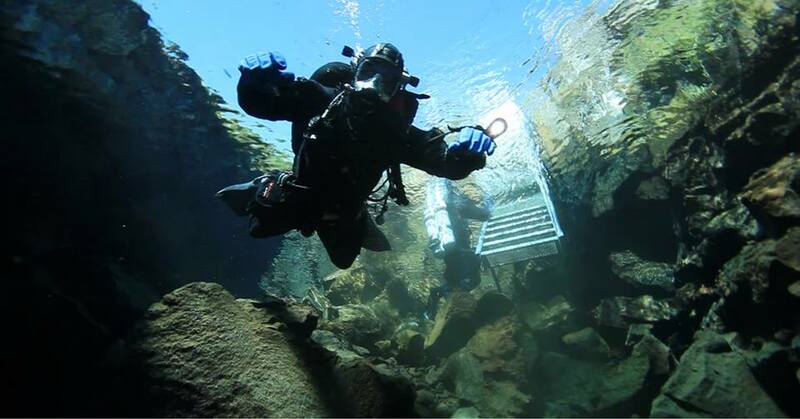 Warm up dives in Silfra, a site made famous for its outstanding visibility. This site was chosen due to the similar water temperatures as the Hamilton dive and its visibility (the good viz was one less thing to worry about in the essential warm up dives). Erik would be responsible for capturing all the trip footage and used these dives to also work on operating the camera with dry gloves. Erik had a leaking drysuit during the first dive which ended the dive quite quickly. It was a reminder that even a slight leak in these extreme conditions could become very serious. A backup suit was used and no further problems occurred. During the morning of the 7th AGA turned up to the expedition house in Reykjavik with 3 bottles of Oxygen and Helium, and everyone was quite relieved. It was only weeks earlier the team was informed that an expected shipment of Helium would not make it to Iceland in time for the dive. The problem didn’t stop there, Helium is in shortage in Iceland and what was available reserved for scientific and medical purposes. Without Helium the dive would not be possible. Helium is used in deep diving to offset the effects of narcosis. After many calls and near begging, AGA came to the rescue. The team drove 5 hours North East from Reykjavik to a small coastal town called Strýtan. The views where amazing on the drive up, rugged mountains laced with snow, valleys with rushing rivers and waterfalls cascading into the ocean from steep costal cliffs. On the 9th the team met up with Icelandic local Erlendur Gudmundsson who took them out to dive the geothermal vents in Hjalteyri. Hot springs have been releasing fresh hot water into the ocean and as soon as the dissolved minerals get in contact with the cold ocean water, they coagulate. Throughout the last approx. 10.000 years this process has created chimneys up to 55 metre tall made of limestone. It is the only known place in the world recreational divers can explore this phenomenon and well worth the trip. The visibility was low and the current was flowing hard on one of the dives, which was a great practice if the boys would encounter the same conditions on Hamilton.